Corrosion is defined as a destructive attack on materials through chemical and electrochemical reactions. Every immersed or buried structure is subject to corrosion. The related risks are important: fire, pollution, and intoxication. Furthermore, it is expensive due to incidental cost linked to product damage, repairs, or replacement works. The most effective way to prevent corrosion is through cathodic protection using an impressed current. This basically reduces the corrosion rate of a metallic structure by reducing its potential, bringing the metal closer to an immune state. 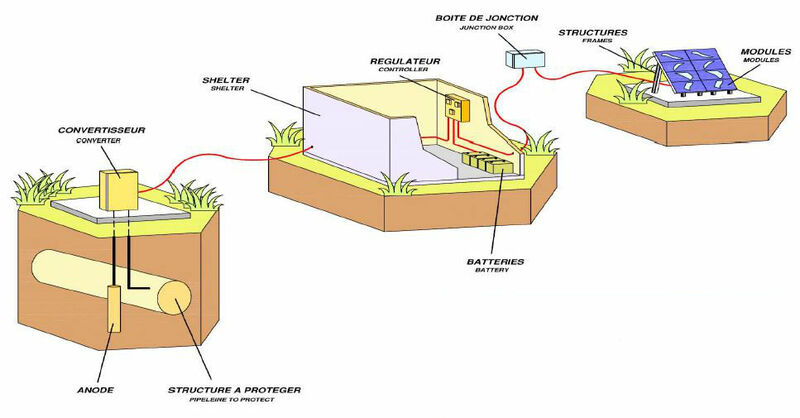 In practice, the metal to be protected is coupled to the negative pole of a solar generator, while the positive pole is coupled to an anode. The current source is solar, it allows an autonomous and permanent anywhere.